Bodytox Patches have now been established in the market place for over six years. Utilising the health and well-being concepts of the Far East and using the highest quality ingredients, they are now the leading brand of patches in the UK and are distributed to 10 other countries around the world and this number continues to grow. The history of detox foot patches comes from Japanese alternative medicine as far back as 1333 AD where the belief was that health depended on unimpeded circulation. The belief then was that disease was an imbalance resulting from the interaction between a person’s constitution and the environment, both external and internal, which forms the context of the person’s life. The ingredients of detox foot patches were part of the remedies introduced during that period to treat illness and the recognition for this type of medicine started to attract attention again in the 1920’s. Today, popularity of detox foot patches is soaring with people wanting to detoxify the natural way. 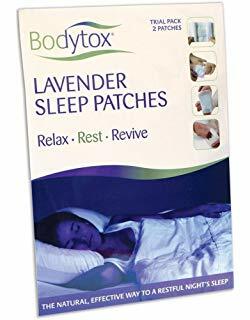 Bodytox® Lavender Sleep Patches contain a high quality blend of ingredients, to include tourmaline, (an energy crystal compound) and wood vinegar as the principal ingredients which help to simulate the actions of Reflexology. The lavender oil contained within the patches works in harmony with the ingredients to not only support the natural cleansing of the body but aid the user to enjoy a restful night's sleep with less sleep interruptions. Scientific evidence suggests that aromatherapy with lavender may improve sleep quality, promote relaxation, and lift mood. According to medical knowledge, the human body has over 360 acupuncture points, with 60 of these and some 7000 nerve endings located on the soles of the feet alone. Reflexology as with other foot therapies works on similar principles to Bodytox Foot Patches, based on the theory that organs and areas of the body are mirrored by a meridian point (acupuncture point). Meridian points on the feet can be stimulated to encourage a smooth flow of energy to the major organs of the body which can create a soothing, calming and cleansing effect where many users report to helping achieve a better nights sleep. Lavender contains an ingredient referred to as ester, which is excellent at relieving fatigue by assisting the user to have sound sleep through relaxing the body and mind. It is a pure and natural ingredient with a unique aroma and vital life energy extracted from herbs with the effect of releasing tension and pacifying the nerves without toxicity. 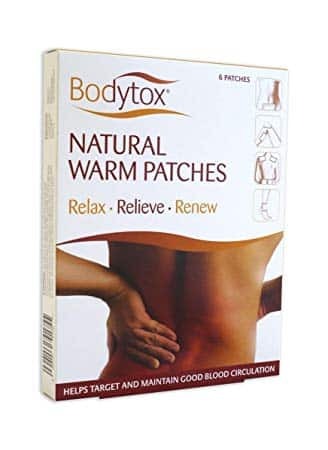 Bodytox® Natural Warm Patches are primarily used for body application to help soothe aches and pains, but can also be effective for carrying out detoxification and maintaining good blood circulation when applied to the feet. The main attribute for both application uses is the production of Far Infrared which Bodytox® Natural Warm Patches delivers to the target area through a process called conversion. When the patches are applied to the body, the FIR properties of the patch can be effective in providing temporary targeted relief to soothe aches and pains by maintaining good blood circulation and revitalising skin cells. Research carried out showed a significant increase in warmth in those who used the Natural Warm Patches.